Elegant candle favors are a timeless and classic accessory that will compliment every special occasion. We have a wide array of candle favors to choose from. We also carry a full range of wedding candle accessories such as candle holders, votives, organza bags for candles, personalized wedding candle tags, scented candles and much more! 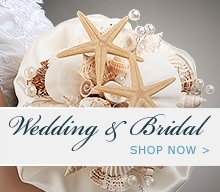 These great party favor is a wonderful destination or beach themed wedding or event. "Queen for a day" Sparkling Tiara Candle Holder. Having a fairytale themed wedding or a sweet 16 party, these encrusted in crown like jewels candle holders will be a hit with your guests. These great candle holder come in a unique champangne design holder great for weddings, anniversaries or bridal showers. A green glass tealight holder adds a creative touch as a centerpiece on a table, a mantle or along walk ways. It measures 4.75" tall and has a diameter of 3". What's black and white and proclaims your love? It's these LOVE design candle favors - perfect for your wedding or shower! These great personalized colored candle holders are a great gift your your guests on your next special event. They come personalized with your choice of colored bottom and design. This votive candle holder also can be used as a large 3oz shot glass. Personalized with your colour print and your logo or special message. Great for weddings, birthdays, anniversaries, or special corporate event. Infuse your wedding reception with subtle color and illumination with these frosted pink tealight cups. Tealight cups come in a set of 4 and measure 2.25" in diameter and 1.25 in height.